Meghan McCain "doesn't understand" the economy, but is still willing to offer her opinion of it on-air. Meghan McCain "just doesn't understand the economy" -- but said she thinks President Barack Obama's stimulus plan is "scary." The daughter of former presidential candidate Sen. John McCain said she's clueless when it comes to the economy and couldn't offer and opinion on her dad's new plan to initiate a spending freeze during her appearance on Rachel Maddow's MSNBC TV show Wednesday night. "I didn't even take econ in college. I don't completely understand it so I'd hate to make a comment one way or the other," said McCain, who worked on her dad's campaign and has publicly spoken out against Democratic competitors on her blog, www.mccainblogette.com. "I keep reading and I just don't understand it." The self-proclaimed lack of understanding didn't stop the 24-year-old McCain from slamming President Obama's omnibus spending bill on "Fox and Friends" Thursday morning -- she railed against the package. 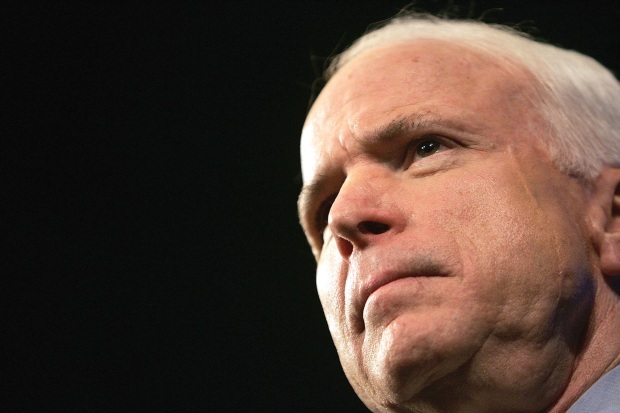 "I think it's so disappointing, and it's scary," McCain said. She also spoke out against house Democrats' rumored supplementary bill, calling it "the second stimulus package Nancy Pelosi's talking about that I think doesn't make sense." McCain blabbed to the press in recent weeks about how her dad's political campaigns stalled her love life. She took pot shots at Republican pundit Ann Coulter last week in a post on The Daily Beast, calling Coulter a "train wreck."